Speaking to Sputnik, Syrian Human Rights Network head Ahmad Kazem said that the resumption of funding was logical, since it will allow Washington to fulfill tasks through a group that Western intelligence services created in the first place. "It's long become clear to everyone who the White Helmets really are," Kazem explained. "Their roots go back to the intelligence services of the US, Britain, France, Israel and Turkey. Therefore, it's only natural that the US finances them, in effect fueling international terrorism. [The terrorists] are financed to a great extent by Saudi money, and so long as this is the case, the US has no problems with this," he added. The activist believes that the US finances some terrorists in an effort to change the balance of forces on the ground, which in the future would allow them to impose conditions in Syria which are beneficial to the West and to Israel. "I cannot exclude the possibility that President Trump is preparing the groundwork to declare the Golan Heights to be Israeli territory, similarly to what happened with the Jerusalem [embassy], and in violation of international law and human rights," Kazem said. At the same time, Kazam argued that Western intelligence services' cooperation with groups like the White Helmets also play a crucial domestic role. "The work of the special services is now among the most important. It is aimed at changing peoples' thinking and making structural changes in society in an effort to control people's minds," he explained. Washington temporarily halted State Department funding for the White Helmets in May. The 'rescue group' has been repeatedly spotted working with Al-Nusra Front*, the Syrian branch of al-Qaeda*, and other terrorist groups in Syria. 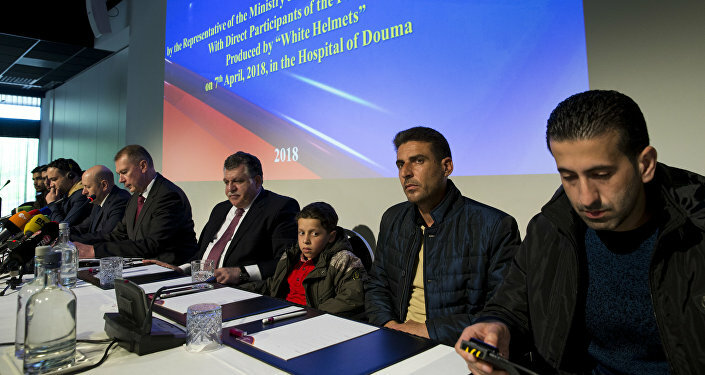 In April, the US, UK and France launched missile strikes against Syria on the basis of a White Helmets report that the Syrian Army had used chemical weapons in the city of Douma. The Syrian government, Moscow and doctors and eyewitnesses from Douma have since revealed that the alleged 'chemical attack' was a fake. *Terrorist groups banned in Russia.